I wanted to stop editing the photos. deviated nose that I got from a failed surgery. When you took a profile shot or a group photo, I had to edit my face to be slimmer. Of course I did not want to take a selfie and I started hating myself for being not pretty. my cheek bones stood out more and my nose was long and bent. I persuaded my husband and decided to do my nose, facial contouring, and lifting. and her central face was somewhat sunken. and rough image rather than feminine and soft feeling. the low part of her face stand out. Besides, her previous rhinoplasty made her nose long and deviated. and the long and deviated nose made her appearance far from feminine. The mother of a baby? Nobody knows that if I don’t say it. You have a baby? How come you are so pretty and slim? This is what I often hear when I go out. Before the surgery, I heard that I was slim but now I hear that I am pretty every day. I used to edit the selfie pictures all the time. And I didn’t want to show my no-makeup face in the morning to my husband. Now, my husband says I look pretty even before washing my face in the morning. I can see hearts in his eyes, which makes me happy. I am really grateful to the surgeons in Braun, who made me feel good at the start of the day. I chanted in my mind ‘It’s ok. I will be ok’ and arrived in the clinic. but my eyes filled with tears without intention. 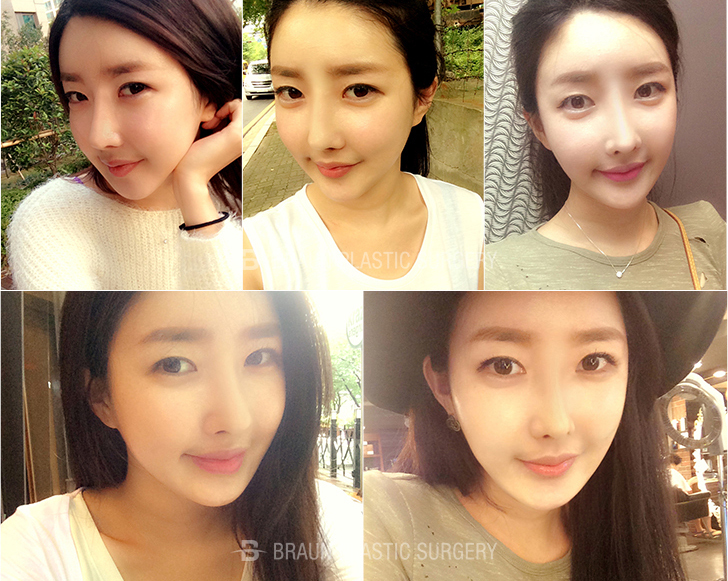 Dr. Tae-gyu Kim told me not to worry and that I would be pretty, and finally, I was relaxed. When the nurse woke me up, I opened my eyes and I was in the recovery room. As the anesthesia started to wear off, I got nauseated and thirsty. I felt dizzy and this was more difficult than the pain. My husband had to take care of our baby, so I was alone. During the time, the nurses checked on me from time to time. When I was thirsty, they helped me gargle and I was so thankful. Thanks to them, I could recover comfortably. I had to endure to be pretty! so I walked around the house as if it was a playground. and in the evening I took my daughter for a walk. I had no difficulty taking a walk except for a little bit of breathing due to the cotton balls in my nostrils. I endured thinking 'this is a piece of cake if the outcome is to be pretty! I felt great breathing without cotton balls. but the line between the swelling was so beautiful that made me excited for the future. I could see myself getting beautiful every day. or if it’s from follow up care at Braun, but my swelling was quickly gone. I could see the difference everyday! In the morning, I looked at the mirror and took pictures at various angles. When I realized the swelling was better, I was so happy that I could forget all the pain. My nose line got shaper everyday along with my V facial line !! On the 11th day, I put on makeup, took a selfie and sent it to my sister. I was so happy that she said I am pretty. I wanted to look at the mirror all day. Pretty face, pretty body, becoming a young lady! Over a month after the surgery, things that were uncomfortable at the beginning improved a lot. and I was so glad that the swelling was gone and the recovery was going well. of it had ended. I was so happy when he said that!! As I was told, I practiced pronunciation and I also practiced opening my mouth. I started yoga to create a beautiful body after a month! I couldn’t do an upside down posture, but I have exercised hard within what I could do. People who I work out together with gave me a lot of praise, saying that I am beautiful. I was so shy. My husband said I became positive because I was a little depressed after giving birth. Now I am positive and bright as I look beautiful! I can do more for my child as well. Every time I get better, I thank the doctors. Getting pretty every day! There is no end. After the surgery, there were many small changes as I got prettier. people passing by stare at me once in a while and I get shy. I've restarted SNS after surgery! I get lots of comments that I am pretty on the uploaded pictures. And there are more people who follow me! Thanks to the good comments, it’s fun to take pictures. I feel confident because of the praise, my self-esteem that I lost got higher. It became my daily routine to hear 'so pretty'. I am really happy for this praise that I wouldn’t have heard if it were not for my doctor!